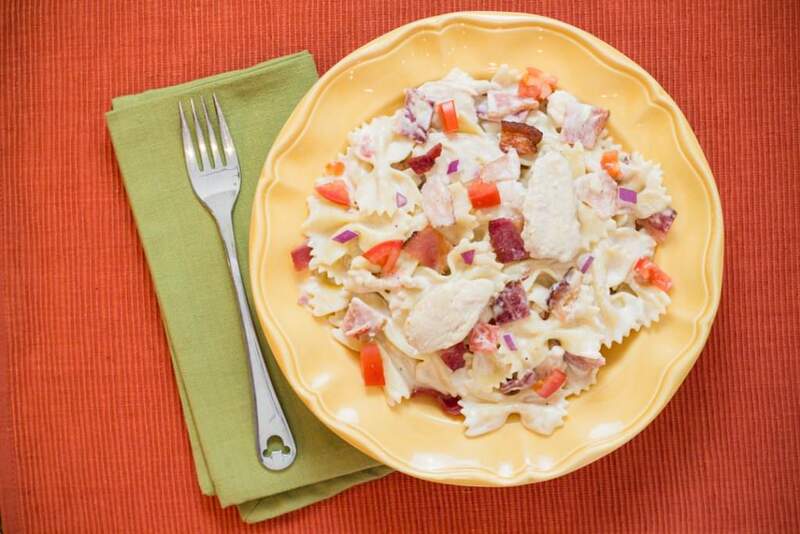 Chicken Carbonara a copycat signature dish from Johnny Carino’s Italian Resturant Bowtie Festival with Chicken, Bacon, Tomatoes, and Red Onion in a creamy Alfredo Sauce served with Bowtie Pasta. and PS – I LOVE IT! 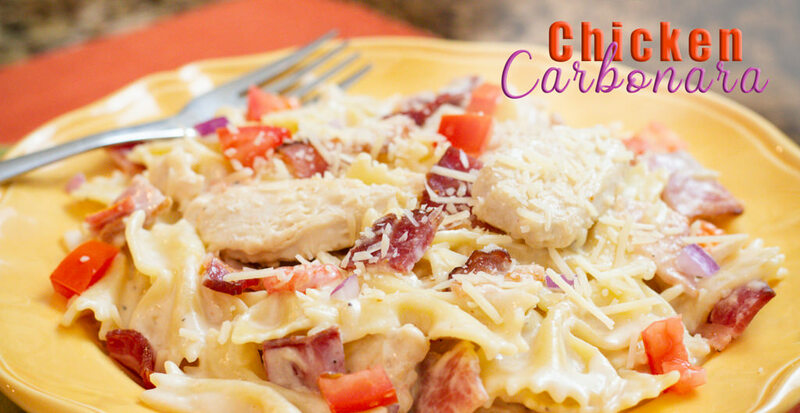 Chicken Carbonara is my favorite and I love the variations in this traditional recipe. 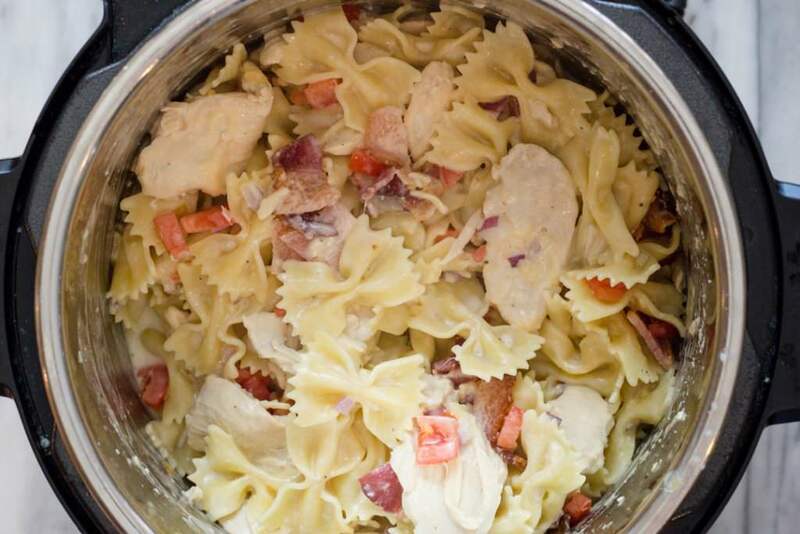 This is a copycat recipe from Johnny Carino’s and their signature recipe Bowtie Festival with slices of delicious chicken, crumbed bacon, tomatoes and red onion served with a creamy Alfredo sauce over bowtie pasta. 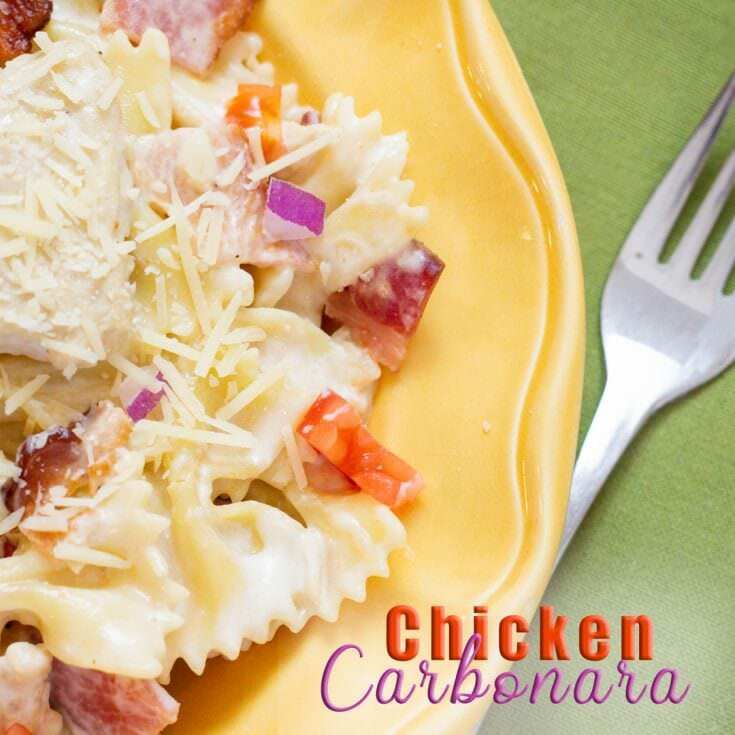 I just love all the flavors in this Chicken Carbonara Recipe. I love a creamy sauce with Chicken. So any combination of Chicken Alfredo is a win in my book for sure. Chicken Carbonara is a signature dish from Johnny Cariino’s Italian Resturant called Bowtie Festival. 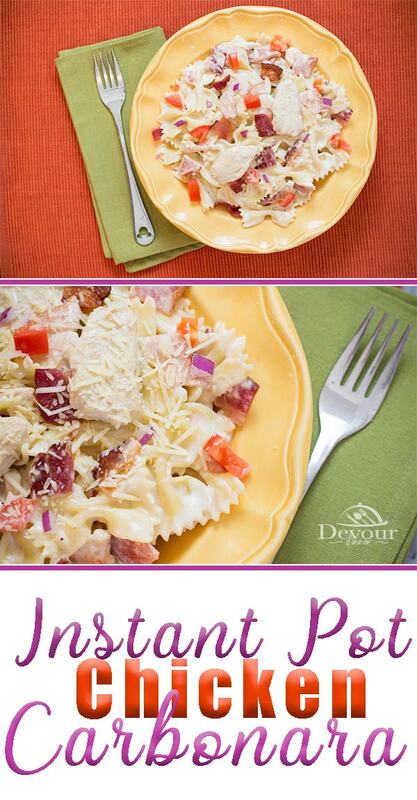 It’s delicious with Bacon, Tomatoes, and Red Onion in a creamy Alfredo Sauce over Bowtie Pasta. 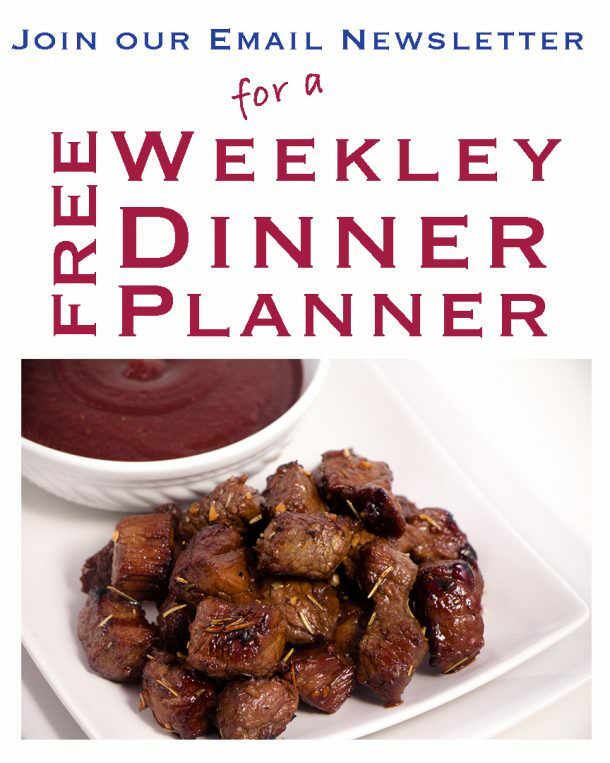 I’ve made this recipe easy using the Instant Pot and it speeds up the time to make and doesn’t lose any flavor that I’ve come to enjoy. This kid approved recipe can be made in 30 minutes or less. Remember my picky eater? Well he has had a blast rating recipes and this one came in at 9 out of 10. That’s great in my book. He didn’t like the red onions which he picked out. For me that’s a mom win! What does Chicken Carbonara have in it? 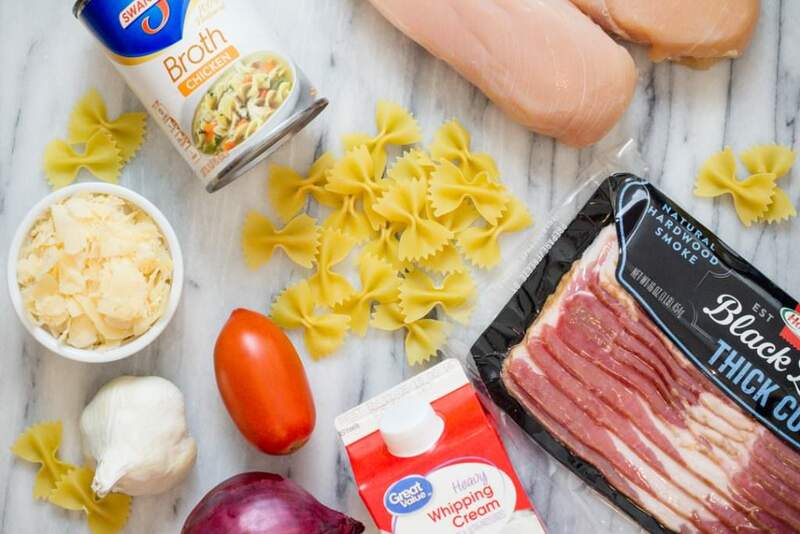 Chicken Carbonara is an Italian recipe with chicken, pasta, bacon, tomatoes in a creamy Alfredo sauce. This recipe also has Red Onion which gives a fun extra taste too. What Does Chicken Carbonara Taste Like? 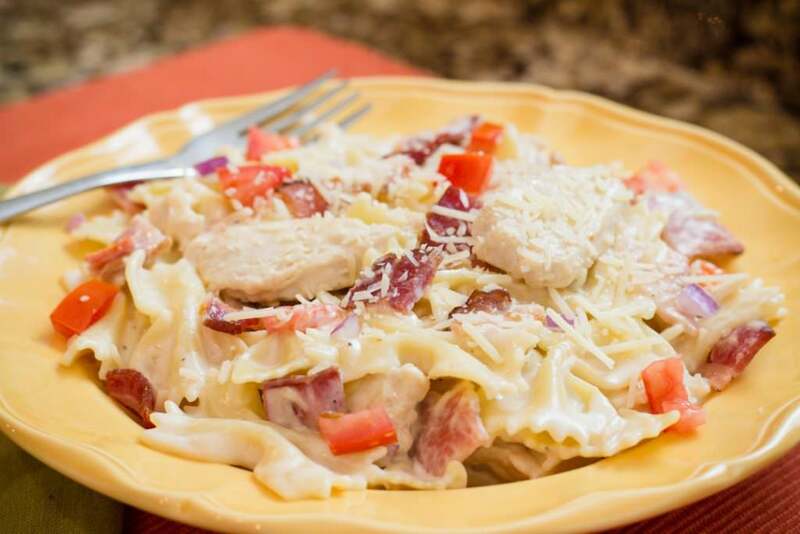 Chicken Carbonara Recipes takes similar to Chicken Alfredo in a creamy sauce. 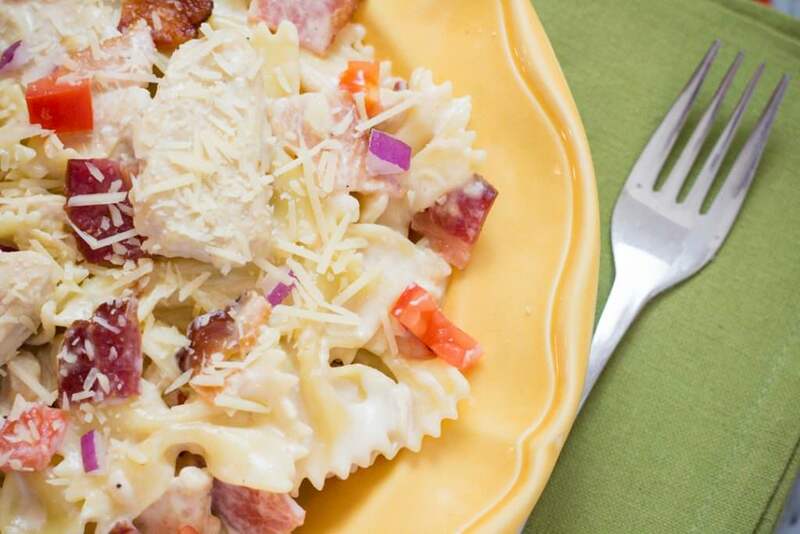 However the extra bacon in this recipe takes Chicken Carbonara to a new party in your mouth. What to Serve with Chicken Carbonara? With any Pasta Recipe, I like to serve garlic bread in any more. How to make Chicken Carbonara? Chicken Carbonara can be made on the stove top or in the Instant Pot Pressure Cooker. See the full directions in the recipe card below. Bowtie Festival is essentially Chicken Carbonara. An Italian Resturant Chain, Johnny Carino’s makes Bowtie Festival which is one of their signature dishes and is amazing! Can I make Chicken Carbonara recipe with less fat? Yes! You can always cut and substitute ingredients. 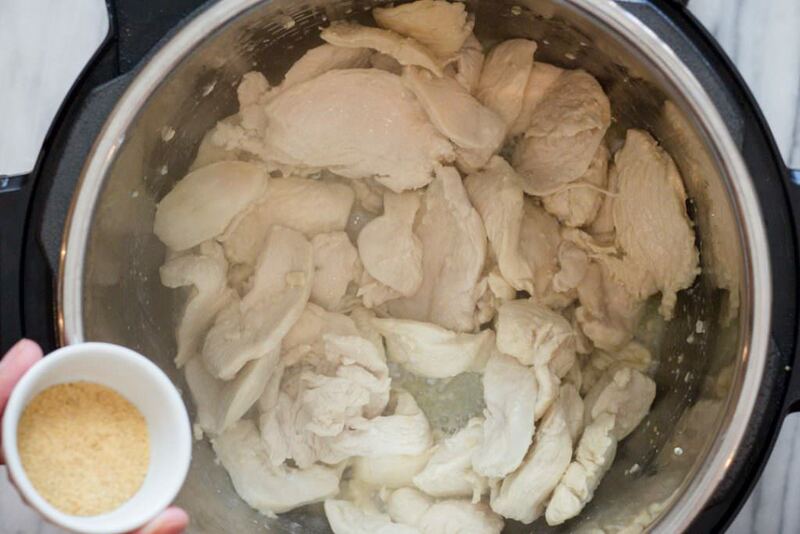 In this recipe you can substitute the chicken broth for water and lower your sodium intake. You can also use Evaporated Milk instead of Heavy Cream. However, do not use Evaporated Milk in the Instant Pot under pressure. It just doesn’t work right. So add extra water or broth to replace the heavy cream for the cooking process and when it’s completed add evaporated milk and cheese. Your sauce will be a little thinner but still have a wonderful flavor. This recipe can be made with other pastas. Adjust the pressure time accordingly. Bowtie Pasta tends to take longer than others. You will want to adjust down for Penne, macaroni, etc. Add broth and heavy cream. Add Seasoning Salts and stir. Pour Pasta in Instant Pot but do not stir. Set Instant Pot to Manual for 6 minutes and Quick Release. Close lid for 2 minutes allowing tomatoes and red onion to get tender. Stir to combine. Garnish with additional Parmesan Cheese and serve. Heat Instant Pot to Saute and wait until it reads "Hot"
Add Broth and Heavy Cream. Add Lawrey's Seasoning Salt and stir. Pour Bowtie Pasta on top. Do not stir. Set to Manual for 6 minutes and Quick Release the Pressure. Stir pasta to break up. Add in Parmesan Cheese and Stir. Gently add crumbed Bacon, tomatoes and red onion and close lid for 2 minutes. Garnish with more Parmesan Cheese and serve. Tips: I find that Bowtie Pasta takes a bit longer than other pastas to cook which is why I suggest a 6 minute cook time. Please note that when using other pastas cooking time will be shorter by 1 or two minutes. I like extra sauce. I tend to add an additional 1/2 cup heavy cream after the cooking process when stirring in the Parmesan cheese. However, it's not necessary. 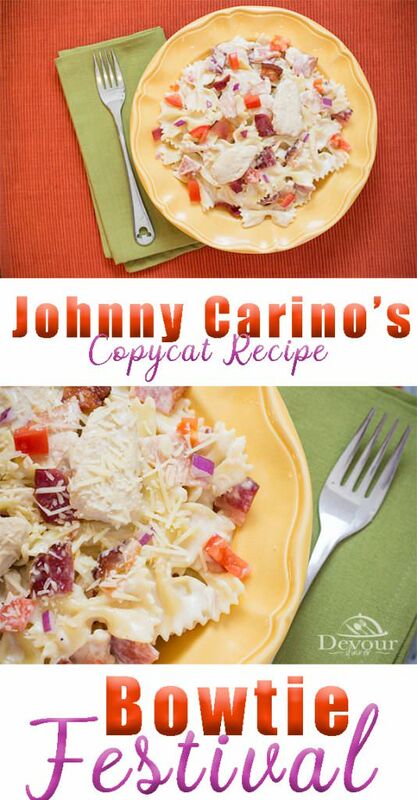 This is a copycat recipe from the Italian Resturant Johnny Carino's and one of their signature dishes. It's also my favorite.